Uses: Art Display, Education Colors: Black Lengths: 13 panel 24'-1" Heights: 6'-0"
We have found that an art display system comes in all different sizes, shapes, and material. It’s the ones that stand up to the test of time that are the best! 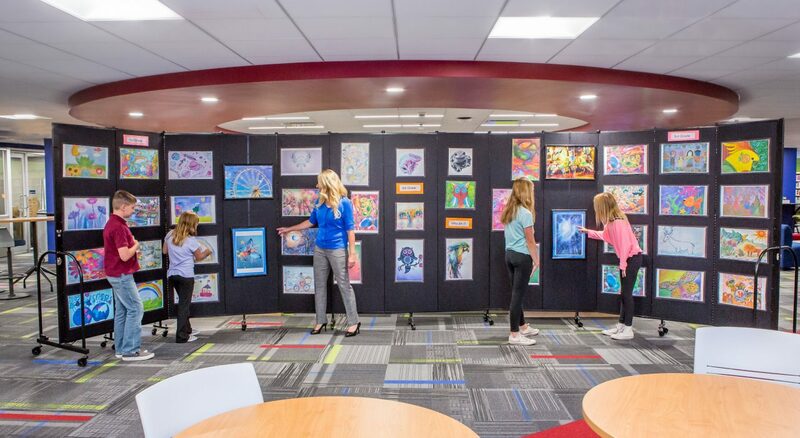 For over 26 years, Screenflex has manufactured portable art display walls. No need for hauling heavy equipment or long setup times. The dividers arrive fully assembled and ready to use. “It’s movable, durable and much safer than other options. Reduces setup time by at least 50%,” remarks Jo Skutt, Harper Centers. Tack, pin or staple items directly onto the fabric panels. Choose from our 38 color and 36 sizes.